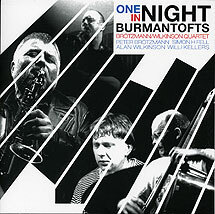 Peter Brötzmann, clarinet, tarogato, tenor saxophone; Alan Wilkinson, alto and baritone saxophone, voice; Simon H. Fell, double bass; Willi Kellers, drums. Recorded at The Irish Centre, Leeds on 11 November 1996. Photographs (front cover reproduced above) by Jo Fell; artwork by Eccabin.